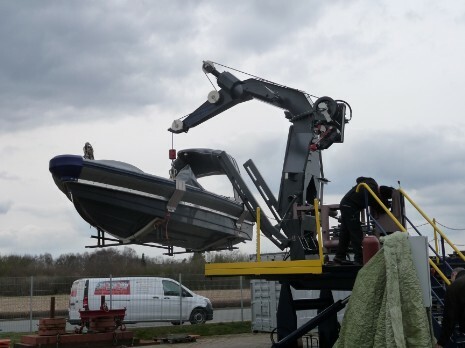 The group name of Rhp.HC-type davits represents the pivot davit systems for the handling of fast rescue boats, with turning-out/in on hydraulic power. The systems are very low-build and combine a low weight with an extreme low centre of gravity. The systems are in full accordance with the present SOLAS-rules and are MED-certified. Stool suitable for welding to deck adapted to the deck situation. Arm in box shape construction. Fast rescue boat winch with centrifugal brake and hydraulic motor with variable displacement. Hydraulic system with accumulator, pressure control system and full automatic wave compensation unit. Electric system with starter box and pushbutton box for on-deck use. Wire rope in galvanized (anti-corrosion) non-rotating steel. Shock absorber integrated in the arm. Stabilzer guiding arms to prevent oscillation of the craft. 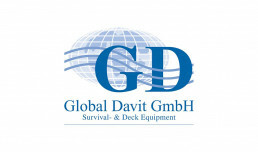 Global Davit GmbH has late 1999 been founded to meet the specific demands of life saving equipment and deck cranes for all kind of seagoing vessels as well as for the offshore (gas-,oil- and wind energy-) industries.